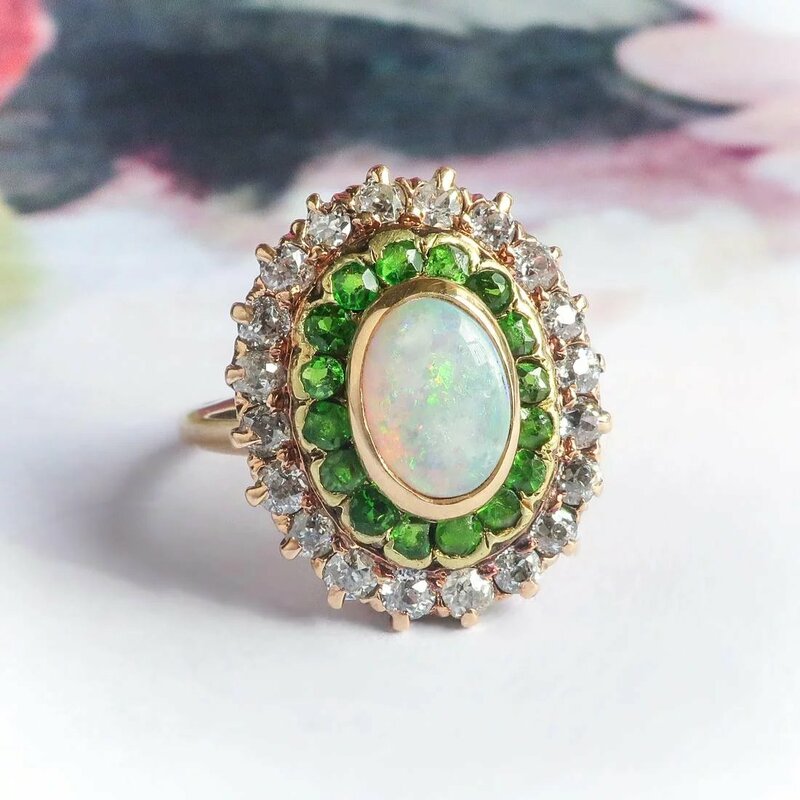 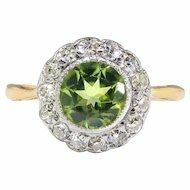 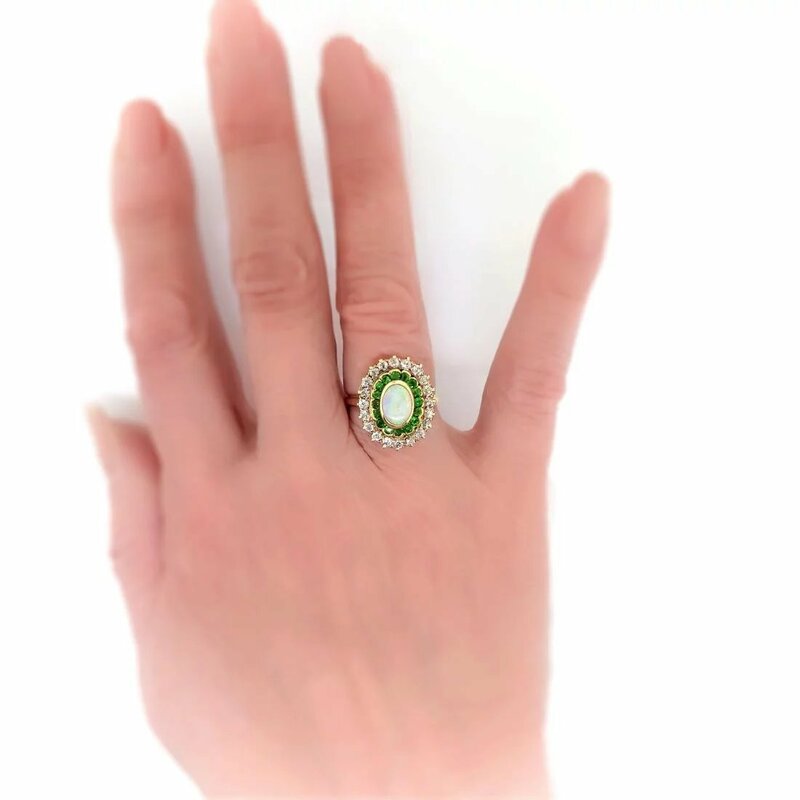 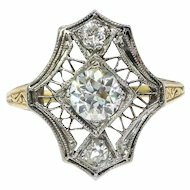 This extraordinary and rare ring from the Art Nouveau era is really unique with it's target halos of green garnets, old European cut diamonds and the central colorful crystal opal! 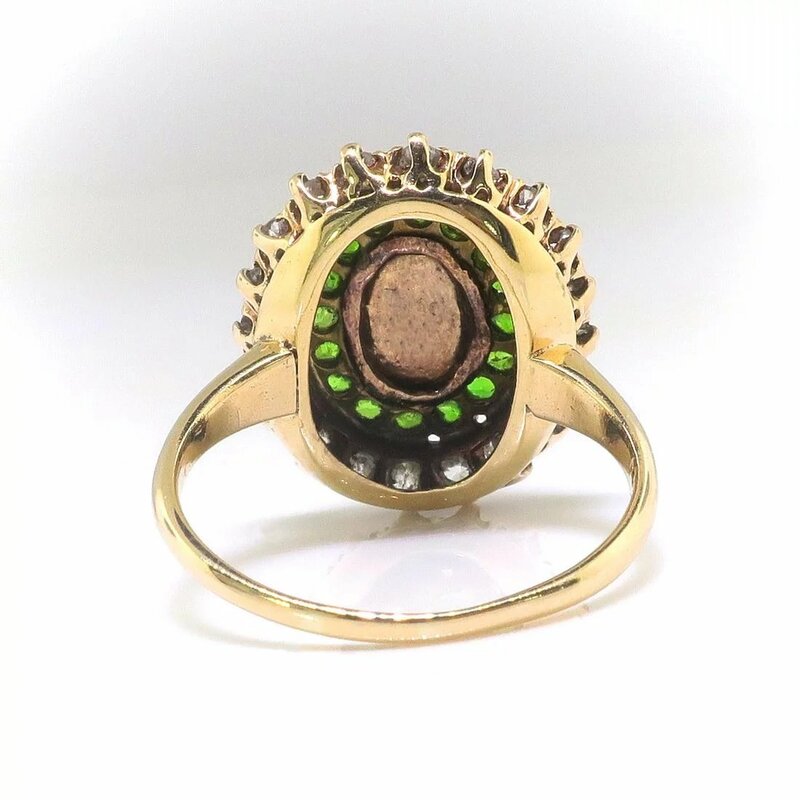 This antique 14k yellow gold, green garnet, opal, and diamond ring, is of hand-made construction, circa early 20th century. 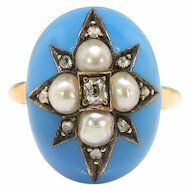 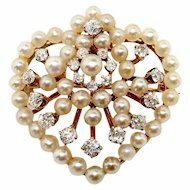 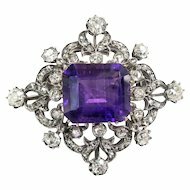 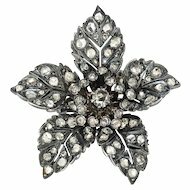 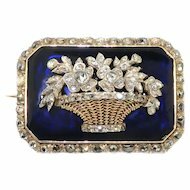 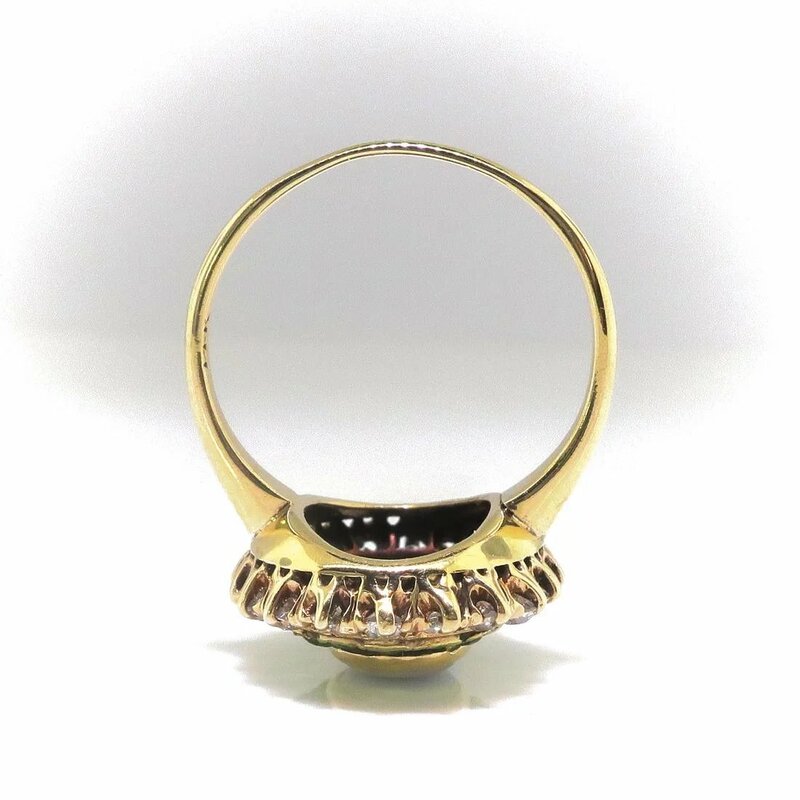 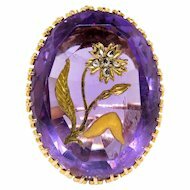 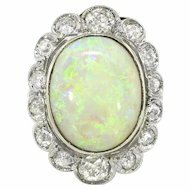 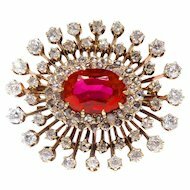 The ring comprises a bezel-set, oval cabochon cut white crystal opal surrounded by 16 partial bezel-set round mixed cut garnets, surrounded in turn by 20 prong-set old European cut diamonds, forming an oval mounting measuring 18.98 x 15.62 x 7.98 mm, on a half-round shank which measures from 1.24 to 3.00 mm in width. 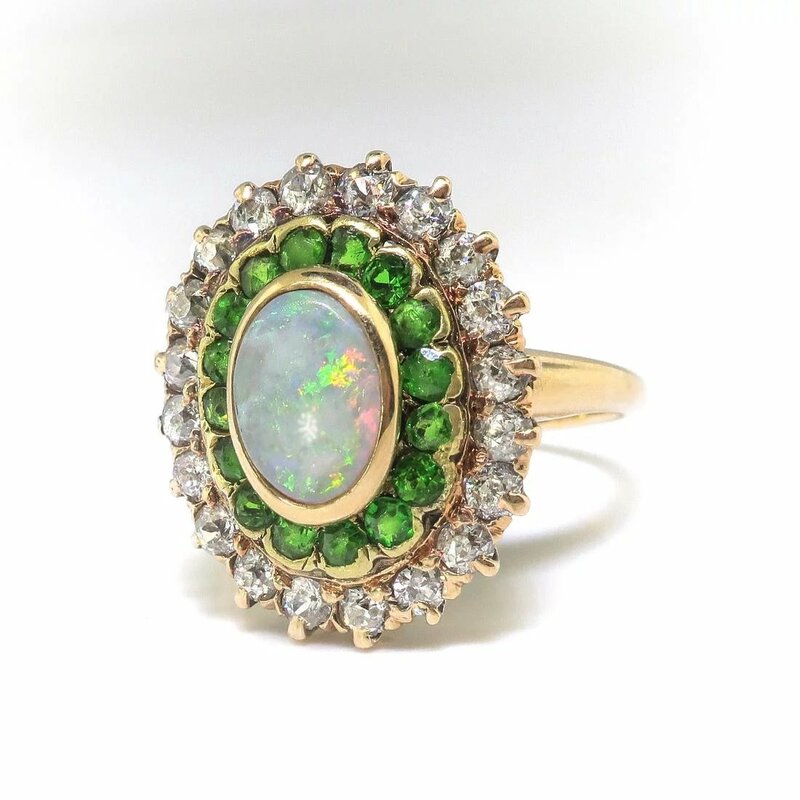 The opal displays yellow, red, and green pinfire play-of-color, measures approximately 8.15 x 5.87 mm, and weighs approximately 1.25 carats. 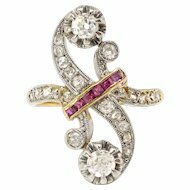 The garnets measure an approximate average of 1.90 mm in diameter, and weigh approximately 0.03 carats each. 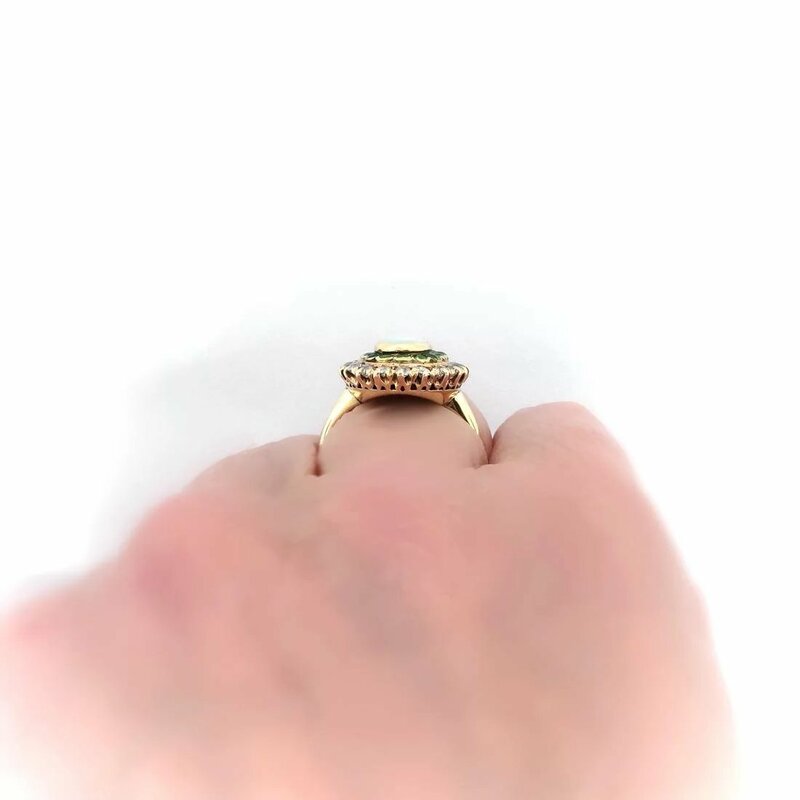 The diamonds are VS2-SI2 in clarity, G-I in color, measure an approximate average of 2.20 mm in diameter, and weigh approximately 0.04 carat each (.80ct t.w.). 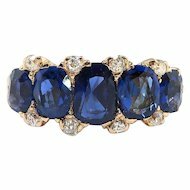 This ring has an approximate total gem weight: 2.53 carats. 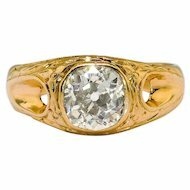 The ring weighs 5 grams, is stamped “14K” being tested and guaranteed 14k yellow gold, and is currently a finger size 7. 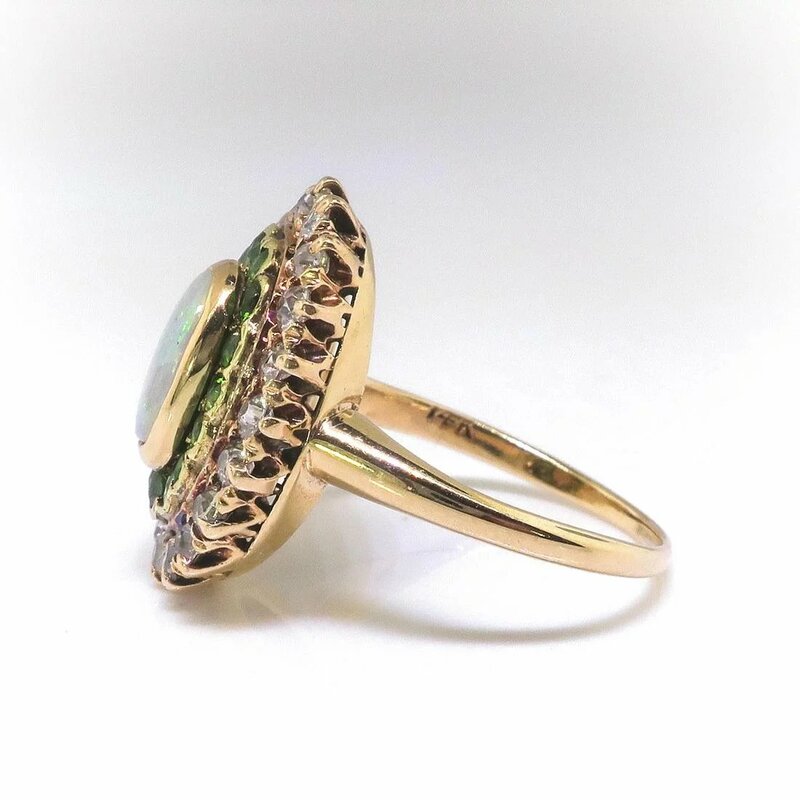 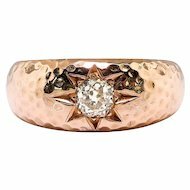 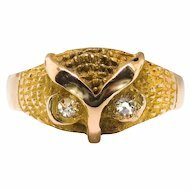 I can have my trusted jeweler safely re-size this ring for a flat $45 gold sizing fee ($90 if more than three sizes up) and will take 3-7 business days to size. 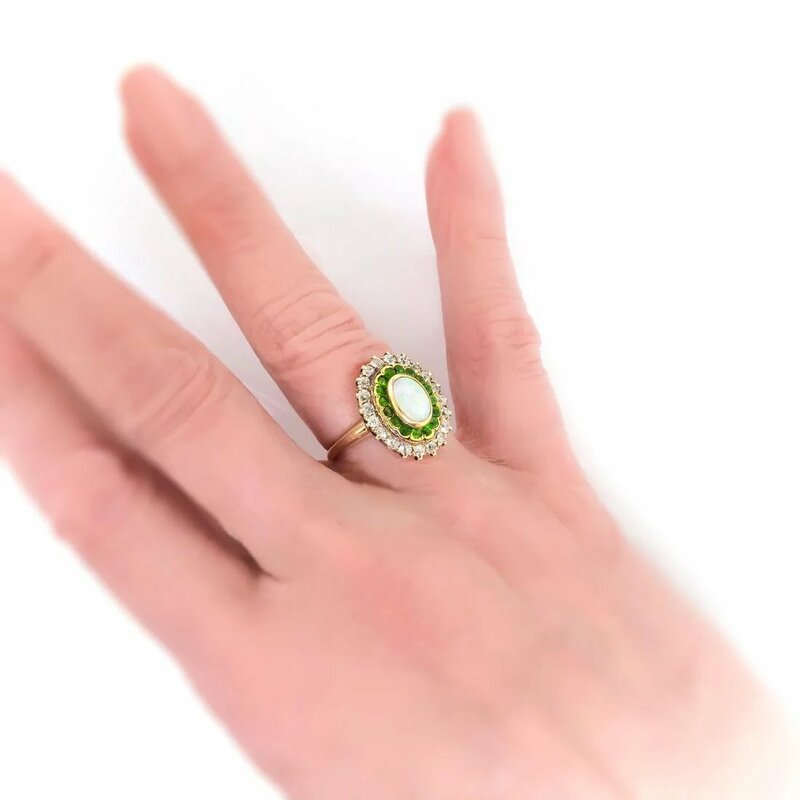 If you would like sizing, just message me prior to checking out and I'll adjust the listing promptly. 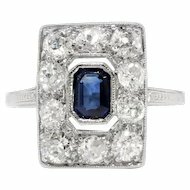 I can also type up a certified current retail replacement appraisal in your name as soon as you let me know you've received the piece, just ask! 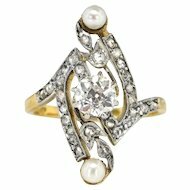 Questions are welcomed on Ring-2461.